Welcome to JMMTrackandField.com. I am very excited to showcase the history of JMM Track & Field on this site. If you happen across this site and have some valuable JMM Track & Field info to add please send an email and I'll make sure I update the site to reflect your contribution. JMMTrackandField.com also serves as a venue to display current info about the JMM Track & Field Program. We have a very strong history. I am eager to build upon this history and shape an elite future for JMM Track & Field that can assure that our athletes compete to their full potential. 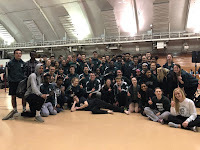 Our returning athletes along with the coaching staff are ready to continue their hard work to reach new personal bests on the track and on the field. I've heard this said a few times before, "there is no off-season". Best of success in your Fall and Winter Sports. There are some clean air-dried uniforms waiting for your sweat.